After some fairly dismal weather over the last few days, the sun managed to pop out for a short while yesterday afternoon. I found a washed out winter creek line on a property not far from home and spent half-an-hour or so wandering around it, taking photos. 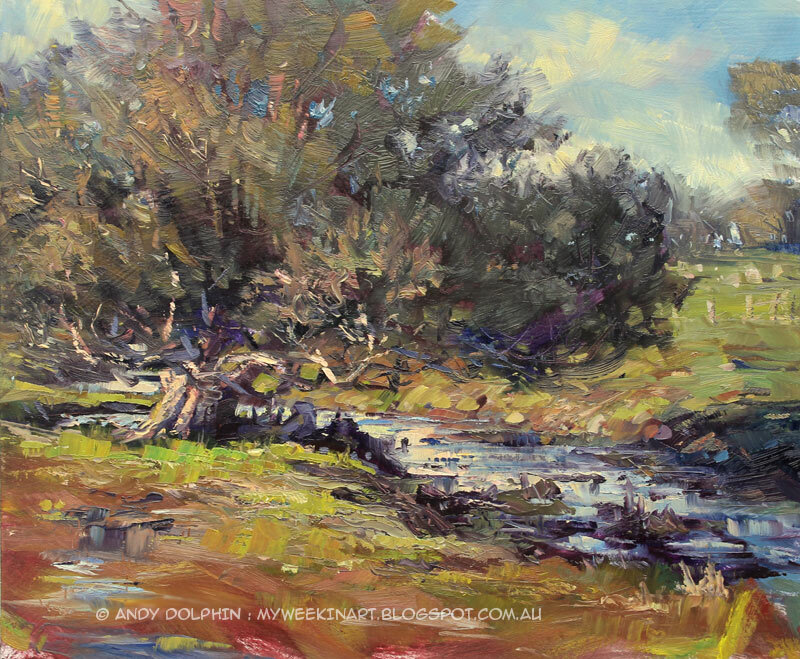 A gnarled paperbark arching over the creek caught my attention and I decided to grab my easel and see if I could capture something in paint before the rain returned or the sun set. It did rain on me and the sun did set, but I got something that required very little attention back in the studio, so I'm not sure who won that race. 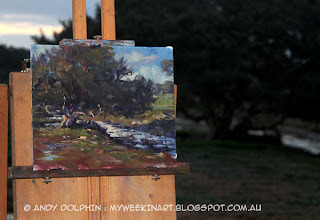 As has been the case with almost every painting I've done in the last couple of months, the sun disappeared behind clouds for most of the time I was painting. It was a fairly simple scene so it wasn't to difficult to remember where the highlights should be but I had to be a little inventive with hue and saturation. And it was cold (by Western Australian standards, not by Moscow standards), it snowed in the nearby Stirling Range in the morning. I actually wore gloves for this one – another "first" for me. And it rained on me half-way through this painting. And it was windy so I had my backpack sitting in my easel tray to stop it blowing away. So relaxing! I used the painting knife again on this one. I think I'm slowly getting to grips with it. It's amazing how, sometimes, it gives you detail you would never have thought to add with a brush, but which looks like it should be exactly where it is. By my count, I've painted at this location seven times now in the last few weeks, and it's rained on me on five of those occasions. Who said painting was relaxing?